The Brief: This meme format communicates the experience of enthusiastically explaining something unbelievable or bizarre. 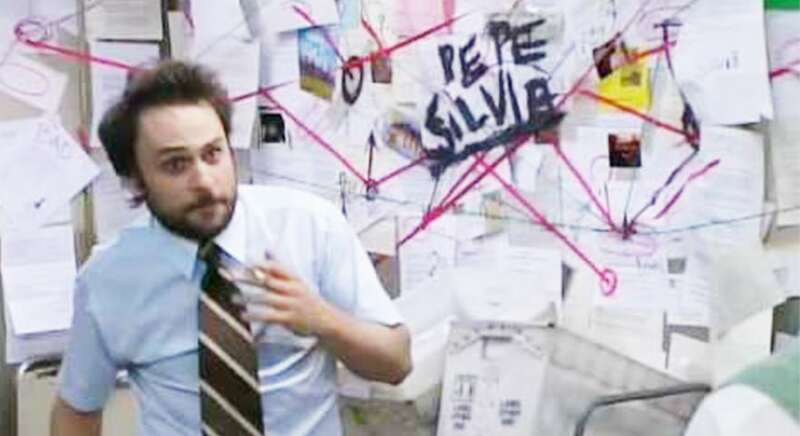 This meme originates from an episode of the comedy It’s Always Sunny in Philidelphia in which the character Charlie Kelly develops a deep, insane conspiracy theory about someone named Pepe Silvia while working in a mailroom. Charlie becomes obsessed with this conspiracy, creating an elaborate map of his ideas. Variations of this meme usually depict a situation in which someone is trying to convey a crazy idea or outlandish theory to someone else. So true, it's not even funny. Anyone who knows shows, knows.